I'm halfway through the Foo-Foo Challenge!! What a night! My jaw bones are sore from laughing so much. Murakami-san finally showed up in time to put on his comedy show for the guests I brought with me...and it was hilarious!! Tonight's ramen was the Seafood Ramen. I ordered it with the Shio base, but then later learned that the Miso would have made a better companion. No big deal to me, the shio still tasted fantastic! It's the CLAW!!! Do you want to know a secret? Can you handle it? The main flavor of this soup comes from crab that is chopped then grounded until it becomes a powder. This powder is what gives the soup its orange tint. I can't believe how much fresh seafood is in this ramen. Wow! They should just call this Ocean Ramen because it seems to contain every living organism from the sea. A sand crab?? I felt sorry for this little guy so I didn't have the heart to eat him. I just let him chill next to me and keep me company. It's been a rough week and to celebrate finishing a project with one of my clients, Murakami-san gave me a few beers to relax. Then he pulled one of his disappearing acts again. 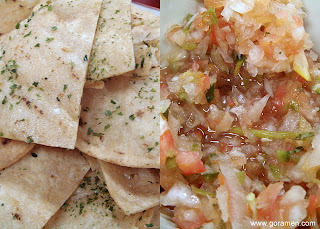 And when he returned he brought out some fresh tortilla chips and homemade pico de gallo. Freshly fried in the back then topped with aonori (aonori? ), these chips were warm and delicious. All that was missing was some tonkatsu sauce...haha jk. The pico de gallo was also the perfect companion to my beer. Wow Keizo, you seem like you really don't have any kuwazugirai dislikes and that's great. I really dig the idea of getting to know a place inside and out and documenting every dish on the menu. I'm learning a lot from your post too. Congrats on the halfway point! Thx Dennis! If it's good enough to be in ramen, then it's good enough for me to eat...hahaha! I used to be really picky as a kid, but now curiosity drives my appetite. You can't have an opinion unless you try it, right? I'm diggin this too! And it's even cooler that I get to share it with everyone via my blog.